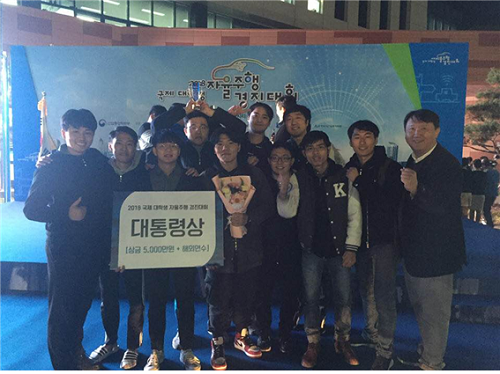 A KAIST team won the 2018 International Autonomous Car Challenge for University Students held in Daegu on November 2. Professor Seung-Hyun Kong from the ChoChunShik Graduate School of Green Transportation and his team participated in this contest with the team named KAT (KAIST Autonomous Technologies). The team received the Presidential Award with a fifty million won cash prize and an opportunity for a field trip abroad. 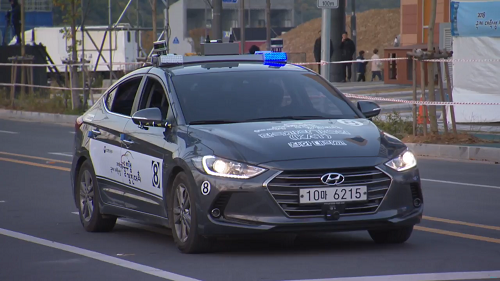 The competition was conducted on actual roads with Connected Autonomous Vehicles (CAV), which incorporate autonomous driving technologies and vehicle-to-everything (V2X) communication system. In this contest, the autonomous vehicles were given a mission to pick up passengers or parcels. Through the V2X communication, the contest gave current location of the passengers or parcels, their destination, and service profitability according to distance and level of service difficulty. The participating vehicles had to be equipped very accurate and robust navigation system since they had to drive on narrow roads as well as go through tunnels where GPS was not available. Moreover, they had to use camera-based recognition technology that was invulnerable to backlight as the contest was in the late afternoon. The contest scored the mission in the following way: the vehicles get points if they pick up passengers and safely drop them off at their destination; on the other hand, points are deducted when they violate lanes or traffic lights. It will be a major black mark if a participant sitting in the driver’s seat needs to get involved in driving due to a technical issue. This contest, hosted by Ministry of Trade, Industry and Energy, was the first international competition for autonomous driving on actual roads. A total of nine teams participated in the final contest, four domestic teams and five teams allied with overseas universities such as Tsinghua University, Waseda University, and Nanyang Technological University.